Once students have taken a paper/pencil assessment using GradeCam™ answer sheets, scoring can be completed. This document will review how to score an assessment using GradeCam™ technology in SchoolCity SUITE. Note: GradeCam is only available for use with the SchoolCity SUITE if your district has licensed GradeCam through SchoolCity. 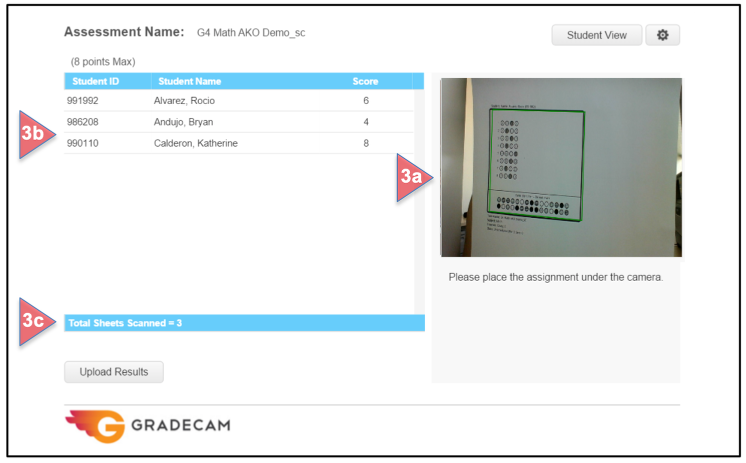 Note: Before you can score assessments using GradeCam, you must first install the GradeCam Plugin. Please see the Help document, Installing GradeCam™, for information about getting set up with GradeCam in SchoolCity SUITE. From the Launchpad, select Assessments from the grid icon in the Top Menu Bar. Please see the Help document, Basic Navigation: Navigating the Launchpad 6.0, for more information. Find the desired assessment from the list in the Assessment Manager. Select the bolded GradeCam icon camera. 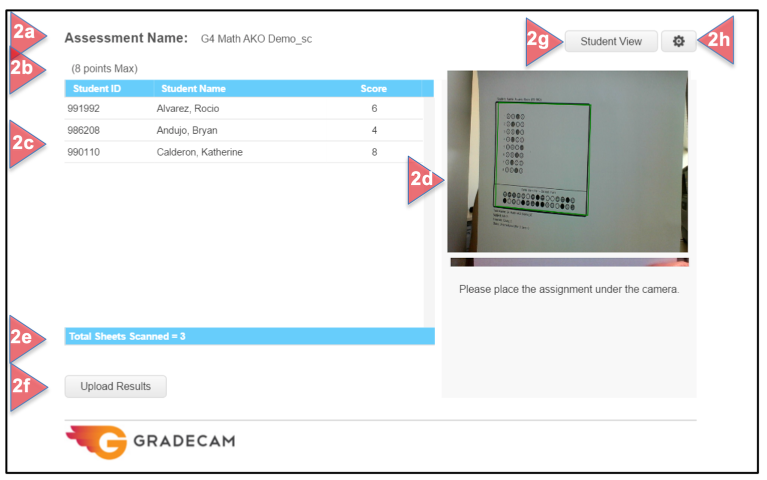 This will take you to the GradeCam scoring screen, where you can scan the students’ answer sheets. Note: The GradeCam icon will be bolded if the assessment has been published, GradeCam has been selected as a method of administration in the assessment setup process, and the assessment window is still open. Or, from the Launchpad, select the SCORE flip card. On the flipped side, select Scan using document camera. Find the assessment you wish to score, or click on More… to go to the Assessment Manager. Place one answer sheet under the document camera or in front of the computer camera. The answer sheet will appear on the screen. When the image is captured as indicated by a green outline on the screen, you may hear a tone as the student’s Score (total points correct) will be immediately listed on the left hand side of the page. Repeat for each answer sheet. The number of sheets scanned will display as you continue the process. After scanning, click on the student’s name. The student’s score (total points correct/total points possible and percent correct) and Missed Questions will appear underneath the scoring window. The student’s responses on the answer sheet can be viewed and/or edited by clicking on the Edit button next to the student’s name. The green circles represent correct answers, while the red circles represent incorrect answers. The correct answer, if not chosen, appears with as a bolded green letter in a white circle. To edit an answer, click on the desired bubble. The student’s score will be updated once it has been saved. The scan may also be deleted. If deleted, the student may retake the test and the answer sheet may be scanned again. 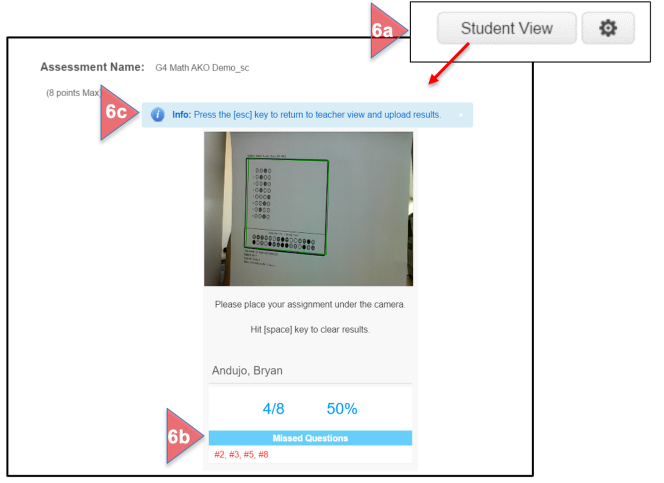 Students may scan their own answer sheets by switching the screen to Student View. In this view, students see only their scores and Missed Questions. Hitting the space bar will clear the results for the next student, protecting student confidentiality; however, the results will be saved in the Teacher View. When all scanning, editing, and rescanning has been completed, click on Upload Results. This will upload all data into the system for reporting. Once the results have been uploaded, a confirmation message will appear with the number of answer documents uploaded and number rejected. Select OK if accepted. Note: This information cannot be viewed once you leave this page. Go to the Report Manager to view assessment results data. If your computer is attached to an external document camera, click on the gear icon to make adjustments. Use the drop down menu to select the desired camera if more than one has been set up. Note the message in blue that the camera image must be right-side up in order to scan. Click on Flip Image, if needed. Click on Done when all settings are correct.